I sat next to Gabe on an Embraer on a two-hour late afternoon flight out of Raleigh, North Carolina. Gabe had the tell-tale wristband on. He was flying alone, leaving his Dad to go home to Mom. Gabe had tears in his eyes as he sat down. Immediately, my Mom instincts kicked in. I didn’t want him to cry. I started asking questions. Gabe was 10 years old, having celebrated his birthday two weeks before with his Dad and his three younger siblings. He was flying to Utah, through Chicago, to his Mom’s house where there were two older brothers. Gabe was the middle kid, craving attention and I was willing to give it. We played the “dot game,” the age-old game my Opa taught me, where all you need is a pencil and paper. I created a 100 by 100 dot grid. The game started slowly, as old-fashioned games do and I completed the first box. Strategy is critical to this game where you try to create the most squares by connecting the dots on the grid. With the fast pace of today’s gaming, Gabe had not taken the time to search for a non-scoring line to draw. From then on, I gave Gabe hints to find the optimal moves so I would not be the runaway winner. As the numbers of completed squares increased, Gabe reached for his backpack for a mid-flight snack. 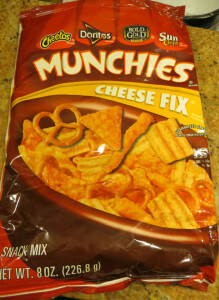 He pulled out an eight ounce bag of Frito-Lays Munchies Cheese Fix® (a glorious combination of Cheetos®, Doritos®, Rold Gold® pretzels, and Sun Chips®), a 12-ounce Mello Yello®, and a TWIX® Cookie Bars. My jaw dropped and my motherly instincts again wanted to intercede with a healthy food option. But, alas, I had nothing in my bag to feed this growing boy, nor would a 10-year old grasp a good food conversation. Living in Seattle, with our abundance of fresh food choices and rabid passion for healthy eating, we are sheltered from middle America eating choices. Granted we read about the supersizing of Americans and high rates of childhood obesity, which fortunately Gabe did not emulate, but the Seattle-area food movement is immune to the pervasive marketing and poor grocery choices found in less food aware regions of the country. According to North Carolina’s Eat Smart Move Campaign, the state has the dubious honor of being the 5th worst state for obese children, with one-third of the State’s 10 to 17 year olds overweight or obese, when using the Center for Disease Control’s (CDC) Children’s Body Mass Index (BMI) Calculator. The calculator, a tool which incorporates teen growth patterns, measures whether a child is at a healthy weight based on their weight, height and birth day. About one quarter of my home state of Washington’s middle and high school children are overweight or obese, which is also cause for concern. In Seattle, we are protected from what much of the rest of the State is experiencing according to the 2010 survey by the American College of Sports Medicine which ranked Seattle as the 8th fittest city in the country with areas of excellence meeting or exceeding the target goal with more farmers’ markets per capita, a higher percentage of people using public transportation, biking or walking to work, and lower deaths rate from cardiovascular disease than other parts of the country. 1540 calories or three-quarters of the calories he would need a day for this moderately active youngster. 20 grams of saturated fat, more than 100% of his saturated fat for the day. 1860 mg of sodium, which is more than 90% of his salt intake per day. 91 grams of sugar or more than double the recommended sugar eaten per day, according to the American Heart Association. Two doses of Yellow Number 5, the artificial food color tartrazine, which is derived from coal tar, and recommended to be banned by British and European Union Parliaments because it “reportedly exacerbates hyperactive behavior in children,” according to Ruth Winter’s, A Consumer’s Dictionary of Food Additives. 8 grams of fiber or about 1/3 of the recommended fiber in a diet for a 10 year old, according to the Nemours Foundation. I know how hard it is to change eating habits. I recently started serving my family brown rice rather than white rice. My teenage son looks at me with his glaring eyes, as I tell him, “I’m just trying to help you have a better diet.” We have a long way to go, but as we each continue make one positive food change at a time, we become a healthier society. This entry was posted in Healthy Food by Kathryn Gardow. Bookmark the permalink. I love this post Kathryn. I absolutely agree that most of us are privileged to eat in a particular way here in Seattle, and are somewhat sheltered from eating habits of the majority of the American population. I would suggest though, after working with children of all ages, that a 10 year old is absolutely capable of having a conversation about good food! I am always fascinated to hear what kids have to say about food, and the earlier we start the conversations, the better. My child is often more receptive to comments from anyone other than her parents… Thank you for sharing your blog Kathryn! I agree that Gabe probably could have understood a healthy food option, but because I had nothing to offer (nuts, dried fruit, etc. ), it made it harder for me to start that conversation. I like how you pointed out the fact that most places view this as a normal snack. When I moved away from King Co. it was similar to moving back to the midwest in respect to food attitudes. Interesting though, I didn’t find this out until I met other parents.